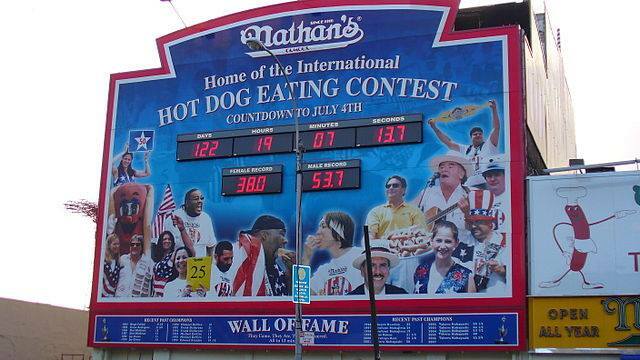 Today, the United States celebrate National Hot Dog Day, dedicated to the All-American fast food classic. While it is undisputed that German immigrants brought the frankfurter sausage, deriving its name from the city of Frankfurt, to the U.S., several theories revolve around the practice to wrap them in a roll or the origin of its name. Some say the Bavarian immigrant Anton Feuchtwanger, who sold hot dogs in the streets of St. Louis, Missouri, provided customers with gloves to keep them from burning their hands. Since most people did not return their pair, in 1880, his wife suggested to hand them out in rolls instead. The dachshund, at that time a popular breed in Germany, often accompanied immigrants on their journey to the U.S., and consequently to their food stands, prompting them to be called dog wagons, hence the name hot dog. Meanwhile in New York, Nathan Handwerker started selling his own hot dogs in 1916 and later opened the now-famous Nathan’s in Coney Island. More than two decades later, hot dogs had permeated American food culture. 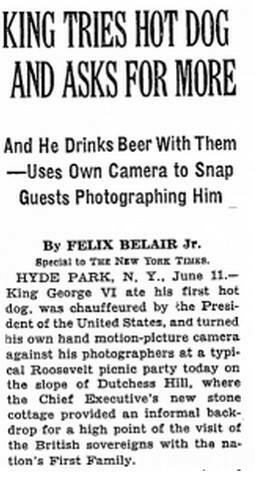 In 1939, President Franklin Delano Roosevelt and his wife Eleanor even served King George VI and Queen Elizabeth hot dogs at their home in Hudson Valley, actually the first time a reigning British monarch had ever set foot in the States — a fact that generated headlines in multiple national newspapers, such as the New York Times. Today, the British also appreciate a good hot dog; if that is due to their monarchs visit to the U.S., however, remains unclear. By the way, while frankfurters are very popular in Germany, they're considered "wiener" or "wiener würstchen" (the German name for Vienna, Austria). Only Austrians call them frankfurters. FDR and his wife Eleanor serve King George VI and Queen Elizabeth hot dogs on their first visit to the United States.